Pasta | eat. cook. blog. Ready to take to a potluck at work! Okay, so I’ve been making this one tuna pasta salad for EVER. I make it often for potlucks (especially at work) and everyone always loves it and asks for recipe. It’s bowtie pasta, tuna, peas, green onions, red bell peppers and a little cheddar cheese in a mayo dressing. The recipe was in a cookbook called “California Kosher” that I bought at a Hadassah conference (yes, I was at a Hadassah conference. Don’t know what Hadassah is? Hadassah, the Women’s Zionist Organization of America, is a volunteer organization that inspires a passion for and commitment to its partnership with the land and people of Israel. It enhances the health of people worldwide through its support of medical care and research at the Hadassah Medical Organization in Jerusalem. Hadassah empowers its members and supporters, as well as youth in Israel and America through opportunities for personal growth, education, advocacy and Jewish continuity. Okay, so I bought this cookbook at the boutique. I liked the cover. And, as it turns out, there are several recipes in there that I’ve turned to over the years (seems those Hadassah ladies are pretty good cooks). The other day, after Tony and I had just gotten home from a two week vacation (the wedding vacation), I was looking at the U-T Food Section and saw this big headline, “Tuna Pasta Salad” and beneath that, “Lemony Pasta Salad”. We had been eating and drinking pretty well while we were away (hey, we were in Sonoma!) and I wanted to make something light for dinner. I read the ingredients – tuna, lemon juice, Dijon, arugula, tomatoes, canellini beans. 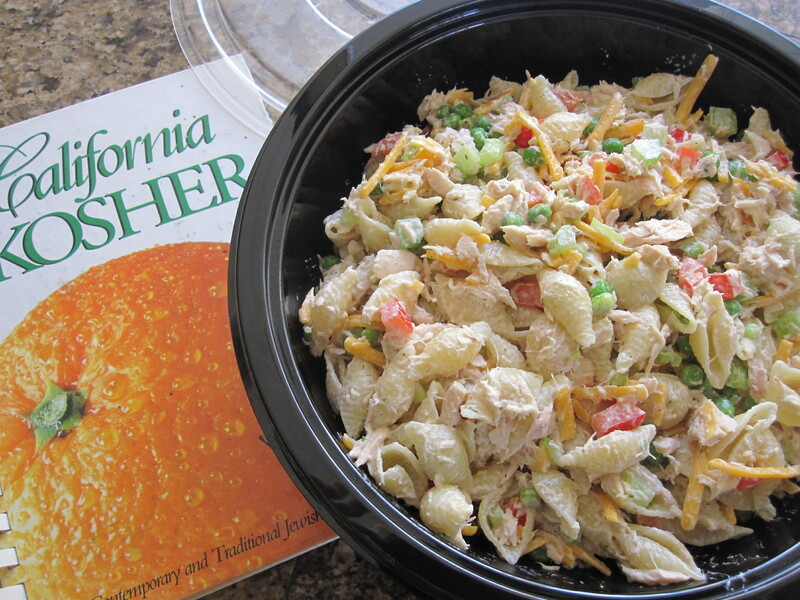 I read that Fitness magazine created this entree pasta salad for Starkist. I suppose if Fitness magazine made up the recipe, it must be healthy too, right? Okay. Done. Decision made. It was delicious. For dinner that night and even better for lunch at work the next day. So now you’ve got two tuna pasta salads to choose from. Both are yummy. A tried and true traditional one and a slightly updated, more modern one. Either would be great to take to your next potluck or for a nice light summer dinner. 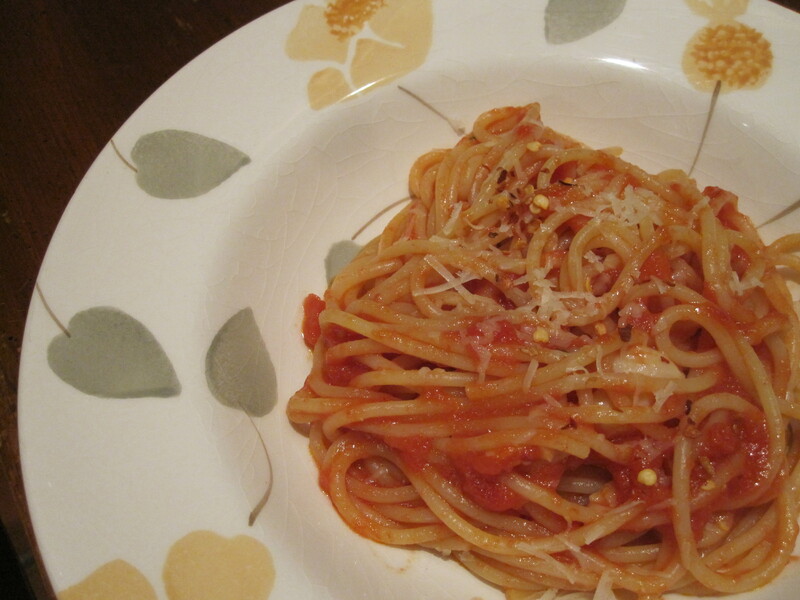 Cook pasta in boiling salted water until “al dente”. When ready to drain the pasta, put the frozen peas in the colander, then pour the hot cooked pasta on top of the peas (this will cook them enough). In large bowl, toss vegetables and pasta together with tuna. In small bowl, combine honey and mayonnaise; gently stir into salad. Stir in cheese just before serving. Cook farfalle according to package directions. Drain, rinse under cold water and drain again. Drain tuna and transfer to a small bowl. Break into rough chunks, drizzle with 1 tablespoon oil and toss gently. In a large bowl, whisk together lemon zest and juice, remaining oil, garlic, mustard, sugar, salt and pepper. 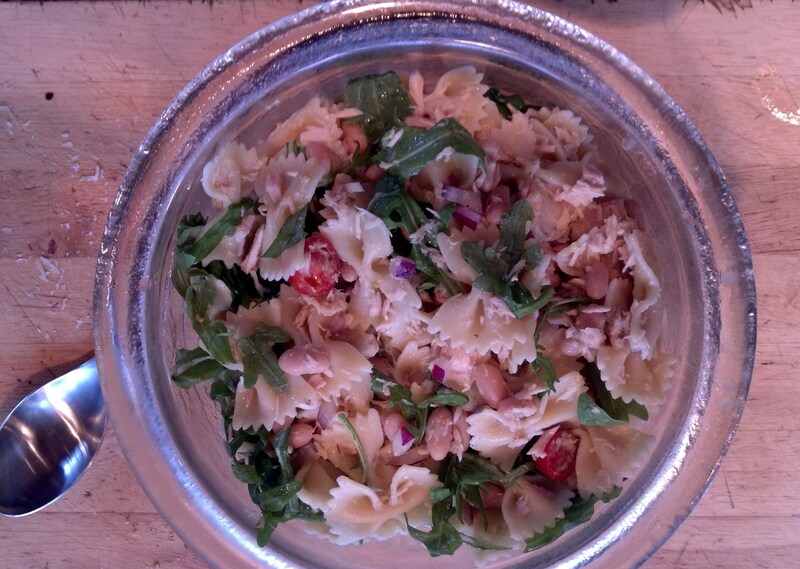 Add farfalle, beans, tomatoes, arugula and onion to bowl; toss well to combine. Add tuna; toss gently. 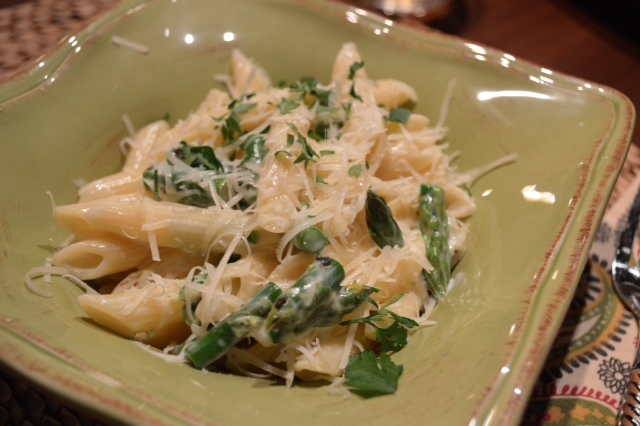 Divide among 4 plates; top each serving with 1 teaspoon Parmesan. “Sammy’s answers pasta plea. By Caroline Dipping.” That was the title of this article in the San Diego Union-Tribune “Readers Ask” column in January 2005. I’m not sure why it made me laugh, but it did. Was it the corny title? Or was it that the food editor’s last name is Dipping? 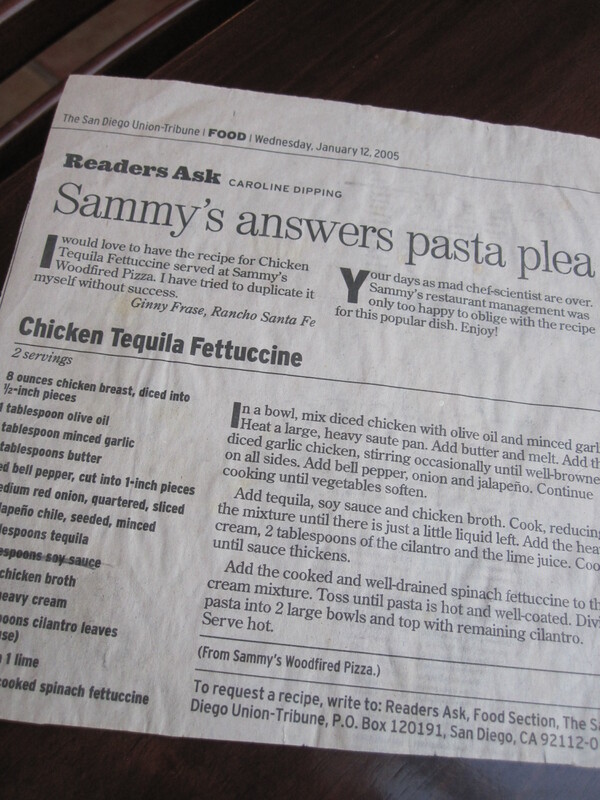 At any rate, the reader was asking for the recipe for Chicken Tequila Fettucine from Sammy’s Woodfired Pizza, a favorite San Diego restaurant. Tony and I really like the food at Sammy’s (though I’ve actually never ordered this pasta). We always order the Grilled Chicken Balsamic Salad (creatures of habit) and a pizza (we do mix up the pizzas a bit…love the Thai Chicken and New York Style). Okay, so Caroline Dipping made me laugh and the recipe sounded yummy and I know the food at Sammy’s is good, so I tried it and have made it countless times since. It’s delicious…the sauce is flavorful and creamy, with a touch of tequila and a little kick from a jalapeño pepper. And I still chuckle every time I pull out the recipe. In a bowl, mix diced chicken with olive oil and minced garlic. Set aside. Heat a large, heavy saute pan. Add butter and melt. Add the diced garlic chicken, stirring occasionally until well-browned on all sides. Add bell pepper, onion and jalapeño. Continue cooking until vegetables soften. Add tequila and chicken broth. Cook, reducing the mixture until there is just a little liquid left. Add the heavy cream, 2 tablespoons of the cilantro and the lime juice. Cook until sauce thickens. Add the cooked and well-drained spinach fettuccine to the cream mixture. Toss until pasta is hot and well-coated. 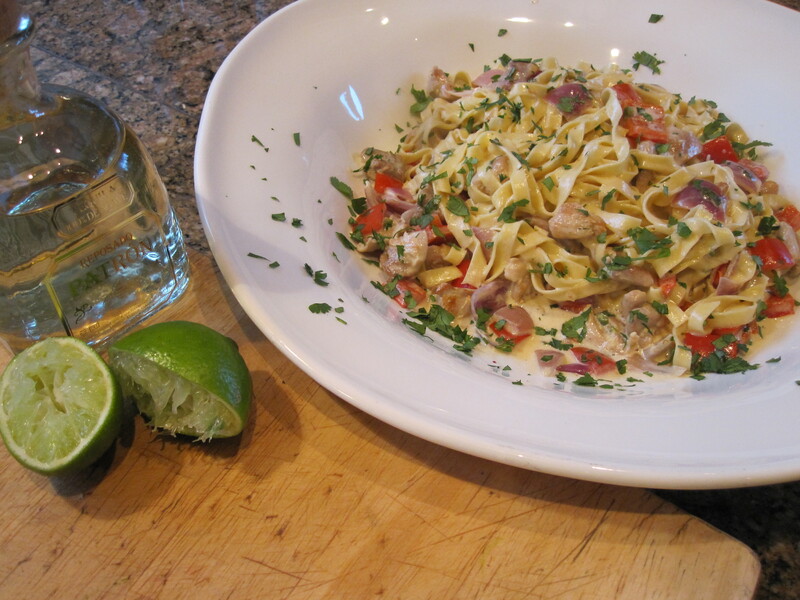 Divide pasta into 2 large bowls and top with remaining cilantro. Serve hot. Okay, the official name given by Bon Appétit (March, 2007) is Nacho Macaroni and Cheese. We call it Nacho Mac, but you have to say it like “Not CHO Mac”, as in, “my mac…not YO mac”. Get it? LOL. Alright, it’s a silly little Bruser family thing. But this is definitely one of the Bruser family’s favorite dishes. It goes without saying that any time one or both of the kids are home, I’ll make it. It’s really easy and one of the best macaroni & cheese’s I’ve ever had. 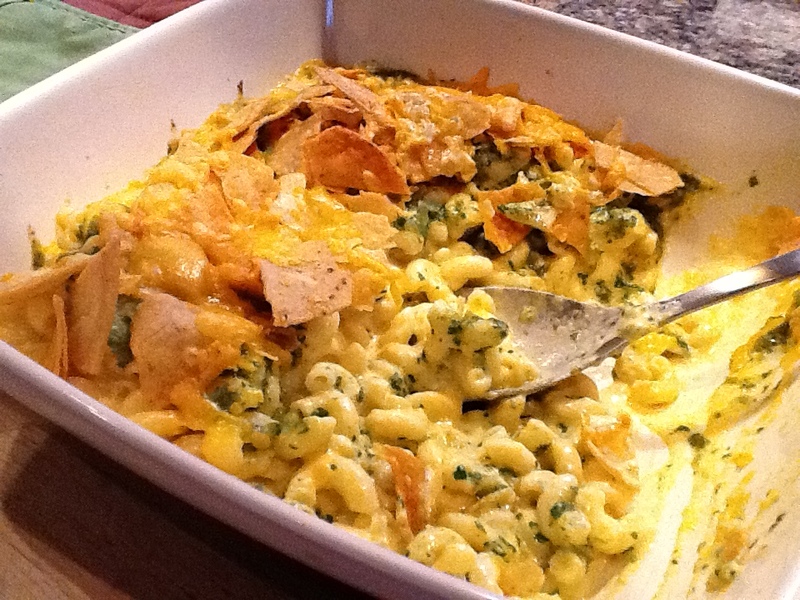 I mean, come on…tortilla chips and salsa verde baked into macaroni & cheese? Make it. And then you’ll walk around saying “Not CHO Mac”, too. Preheat oven to 425°F. 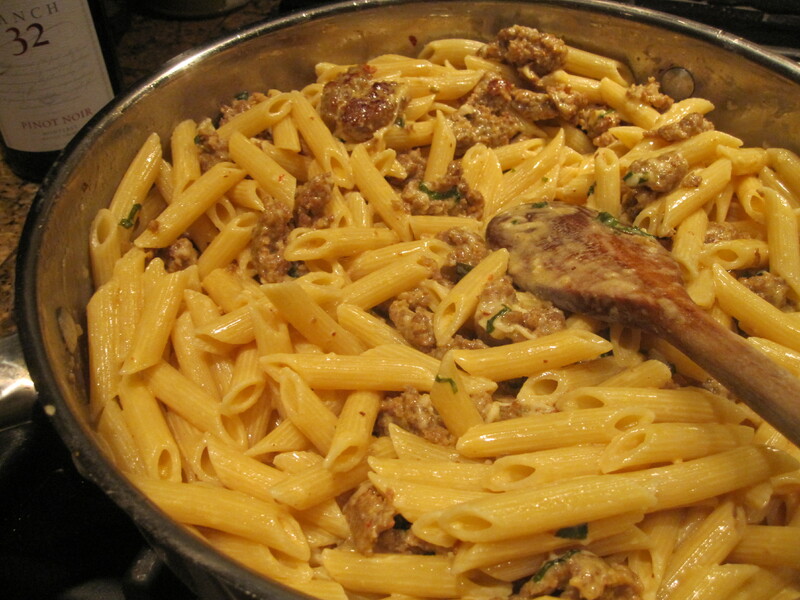 Cook macaroni in large saucepan of boiling salted water until tender but still firm to bite, stirring occasionally, about 6 minutes. Drain. Meanwhile, blend salsa and cilantro in food processor or blender. Toss 2 cups cheese and flour in medium bowl to coat. Bring milk, cream, and cloves to simmer in large saucepan over medium-high heat. Add cheese mixture. Whisk until sauce is smooth, about 1 minute. Mix in macaroni; season with pepper. Spread half of macaroni mixture in a casserole/baking dish. Drop half of salsa mixture over in dollops. Sprinkle with 1/2 cup cheese. Top with remaining macaroni mixture and salsa mixture. Sprinkle chips over. Top with 1/2 cup cheese. Bake until heated through, about 10 minutes.